Everyone remembers “Antennagate” for the iPhone 4 when it launched. The phone had some less than stellar antenna placement that caused calls to be dropped if you had your hand covering a certain part of the phone. To right this problem, Steve Jobs said “you’re holding the phone wrong” but eventually Apple backed on that stance and offered bumper cases to everyone that wanted one. 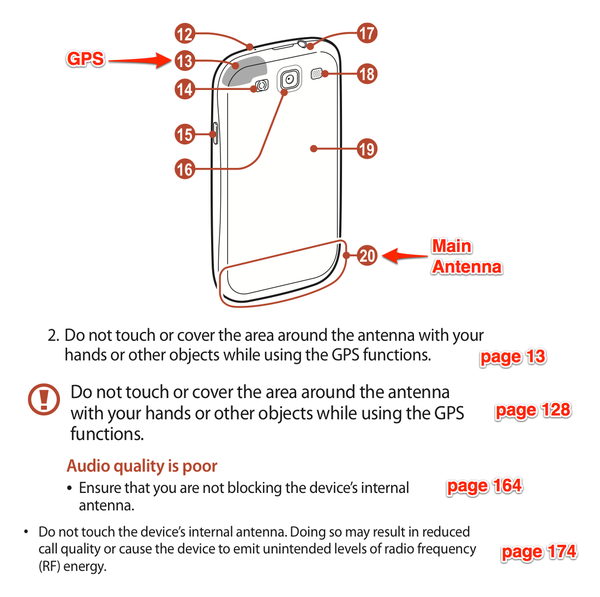 It’s well documented at this point that Samsung wants to be on the level as Apple, and this picture taken from the user’s manual of the Galaxy SIII is just too funny not to share. The antenna for the SIII is located at the bottom of the phone, which would be awkward to grip with one hand when the phone is 4.8″ large but Samsung makes sure to note that you should not hold it there. Granted, there are spots on any phone that if you hold your signal will suffer but we have to put the latest and greatest smartphone though it’s paces don’t we?